The Polytechnic Netball Club is the oldest continually existing netball club in the world, as certified by the Guinness Book of Records. Records of the club are held by the University of Westminster Archive. The history of Netball at the Regent Street Polytechnic (as the University was then known) dates back to 1907. Prior to this there is no mention in the archives of any ‘basket’ or ‘net’ ball activity. But at a Garden Party on 8 June 1907 an exhibition match was held at the Polytechnic’s Quintin Hogg Memorial Sports Ground at Chiswick between a Men’s Basket ball team and a Women’s basket ball team. From then onwards there are regular references to ‘basket’ ball until 1910 when references change to ‘net’ ball (for both men’s and women’s teams). 1914 sees the first mention of the ‘netball cup competition’. The team was coached by Miss Amy Gates and the Gymnasium agree to provide a Silver Cup and medals for annual competition. The Poly League included 4 Poly teams, as well as 2 teams from Morley Hall and teams from St John’s Lewisham, Tellington Old Girls and Catford Ladies Gymnastics Club. The London and Home Counties Net Ball Federation formed in 1925, with the Poly Netball Club as a member. The same year the Club advertised for new members. It practised on a Wednesday night in the gymnasium at 309 Regent Street from 6.30pm-9.30pm. From September 1935 the Edward Marjoribanks Cup was awarded by Mr & Mrs Quintin Hogg to the netball team with the best record across the season. 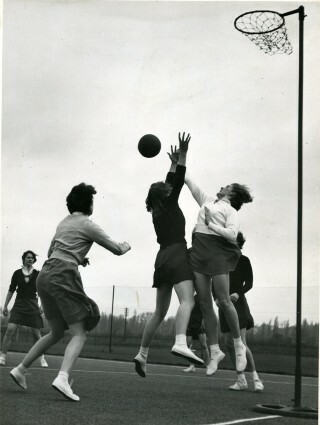 In 1958 Town and Country Planning made the first netball film at the Poly ground in Chiswick . The Poly Netball Club separated from the University of Westminster in 1992.